This is Part Two of a three-part series. Read Part One here. The history of the Massachusetts Review offers, as I’ve just suggested, certain lessons about the contingent and variable nature of taste—and about the difficulties encountered trying to change it. That history can’t, of course, explain why, of all the lessons one might learn from a magazine like ours, this is what matters most to me. Surely, some of what I’ve learned about this subject I was taught in grad school, during those years where your cultural tool kit gets opened up, tossed out on the ground before you, and you have to decide what to take up and what you plan to do with it. In grad school as elsewhere, though, you learn best by doing. So it was for me. Whenever asked about those days, I invariably point to a single class as the most formative for me at Penn: a small seminar with Stuart Curran, on British women writers from 1780-1815 (or was it 1830?). Not, one might think, an obvious choice, since, although I have taught the writers we read then, it certainly isn’t my field (assuming I have one), and I’ve never published anything myself on the subject. I took the class mainly because Curran was something of a legend for us Comp Litters and for our friends in English (and also legendarily tough). Taking his British Romanticism survey would have been more logical, but I’d missed out on that one and so opted for the seminar, my last chance to work with a master. As it turned out, only a few students enrolled, maybe five, no more than seven. On the first day of class, Professor Curran arrived with copies of a lengthy bibliography which he passed out to each of us. Simply a list of British women writers from that period, at least twenty-five of them, maybe as many as fifty, along with the most complete bibliographic material of their publications that any scholar had yet put together. I don’t believe I’d heard of more than a few, but that wasn’t just me, none of us had. The task we were set was simple: each of us took a few pages of the bibliography, to find out what from the list was available in the library at Penn. Professor Curran warned us not to use the computerized database, only the card catalogue, since the former was anything but trustworthy for writers such as these. Once we knew what we could access, he said, we’d put the syllabus together. Each week we’d be assigned two or three of the authors from the list, and everyone would read as much as they could. There was a study carrel in the library assigned to our seminar, and all the books would be kept there, so everyone could share them. So that’s what we did, week after week. Writers like Anna Laetitia Barbauld and Hannah More, remembered then (if at all) only as members of the Blue Stockings Society, or Mary Robinson, actress, poet, dramatist, and member of the Della Cruscan group. 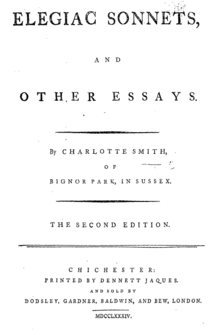 Or Charlotte Smith, a writer whose complete works Curran would later edit. The author I ended up doing my seminar paper on was Mary Russell Mitford, then known (again, if at all) for her sentimental sketches of English country life in Our Village, or as a friend of Elizabeth Barrett Browning. That was surely the single worst essay I ever wrote in grad school (during a time when I wrote a lot of rubbish indeed), yet Professor Curran failed to live up to his reputation for severity and let me escape unscathed. In fact, he had our whole group over to his place for dinner; the wild mushrooms he served us, a Tuscan recipe, was one of those meals you never forget. So why I am telling you all this? Two reasons, really. First, it’s a good demonstration of how literary tastes change: if it weren’t for Professor Curran and the cohort of feminist scholars allied with him, most contemporary Romanticists might still have never read these writers, yet many were among the most celebrated literary figures of their time. Mainly, though, my point is personal. What I most remember from that seminar, and what changed my own way of reading irrevocably, was a pattern in my experience of those authors. Put bluntly, when I first sat down to read them, my initial reaction was invariably the same: this stuff is horrible! Sentimental, purple prose, over-wrought and over-written, there was really nothing there, so far as I could see, that made these books qualify as literature at all. Moreover, it was physically difficult to read, so boring that I could hardly keep my eyes on the page, for page after page (though I knew I had to—in a small seminar, there’s no escape, you’re either prepared or you’re not, and everyone will know). So somehow I plowed on, week after week, slogging through this slush, trying to figure out how anyone ever thought there was a there there. Until—and this is what completes the pattern—at some point, I’d start to see something. Some aspect of one poem would connect with another, and I’d have a brief note or two to write down, something to report. And then, more often than not, this small glimpse would lead to another, and slowly I’d find myself behind the looking glass, in a different time and place. Even if I didn’t know what, I at least knew something was afoot, and from there the work really began. There was, after all, something happening in these texts, so there had to be a way to talk about it. I remember the discussions in that seminar as the best literary debates I’ve ever been a part of, or ever hope to be. Charlotte Smith was, not surprisingly now, the writer who completely blew us away. I remember the moment where Professor Curran said, as if he’d just then seen it himself: Smith’s poems had Wordsworthian lines before Wordsworth himself had written them. Not everyone cares, of course, about this stuff, but to witness a find like this, well, it was simply amazing. At least as important, or so it seemed at the time, was reading another work by Smith, her Beachy Head, and realizing how much of twentieth-century phenomenology, anthropology, botany, and geology was contained, in potentia, in that poem. Gerry O’Sullivan, the Comp Lit colleague most responsible for guiding me to Curran, went on to write his dissertation on how gender and social divisions influenced the study of botany during this period. As for me, as I’ve said, the road mainly went elsewhere, but the lessons remained. What I took home with me from that unforgettable semester was that foreign languages exist within languages as well as between them. Given sufficient social, political, or historical separation, you end up with mutually incomprehensible languages, no matter whether the words come from your mother tongue or not. Many years later, when I was first anointed or conned into my current job as editor, I promised that the Mass Review would publish more in translation. When I said that, though, I hadn’t forgotten my training with Professor Curran. Many of those translations, I knew, would also come from English.